I love measuring brown sugar. It reminds me of making sand castles at the beach. It's also great for working out your aggressions when you've had a bad day. Ha! 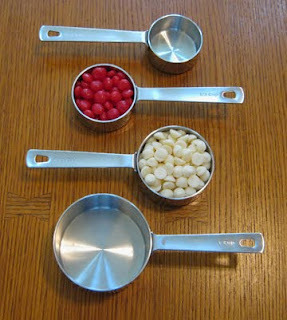 Choose the measuring cup size your recipe calls for. Choose a regular kitchen spoon. Scoop a spoonful of brown sugar from the container. Put it in the cup. Using the back of the spoon press the sugar firmly down into the cup. Use some elbow grease and really pack it in there! Add another spoonful of sugar and repeat. Level off the top with a straight-edge kitchen knife. How do you know you measured right? 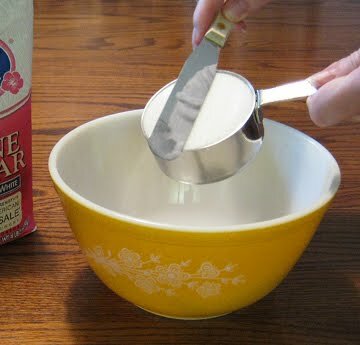 When you remove the sugar it should keep the shape of the cup as shown. Tip: If your brown sugar is hard you can soften it in the microwave. 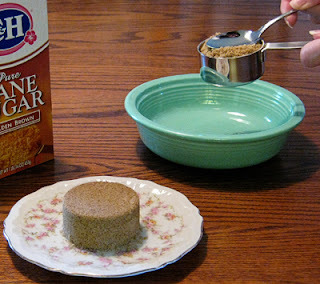 Place the brown sugar in a microwave-safe bowl. Cover it with a lightly-dampened white paper towel. (I usually sprinkle the towel with a little water from the tap.) Zap it on high for 20 seconds. Check for softness. If it's still too hard zap it for another 20 seconds. Stir. Be careful when removing the sugar from the microwave. It will be hot! 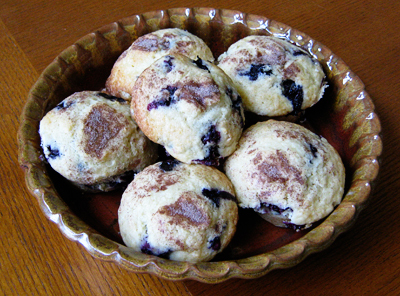 If you like your muffins sweet and cake-like you'll love this recipe. This recipe makes eight bakery-style (large-topped) muffins or twelve regular ones. When coating the muffin pan with non-stick spray, also spray some on the top of the pan. This is so the underside of the bakery tops won't stick. Fill up the muffin cups full to the top. The batter will rise up and over just a bit making a big round top. Add four minutes to the baking time. Preheat oven to 350 degrees. Coat the muffin pan with non-stick spray. Cream together the butter and sugar until well blended. Stir together the beaten eggs and milk. Add eggs and milk mixture to the butter and sugar. Stir to blend. In a large bowl stir together the flour and baking powder. Add the wet ingredients to the flour and baking powder mix. Stir all together, mixing just until all dry ingredients are absorbed. (There may be a few small lumps in the batter, that's ok.) Add the blueberries to the batter. Gently folding them in with a spatula. We want the berries to stay whole. Fill up the muffin cups. 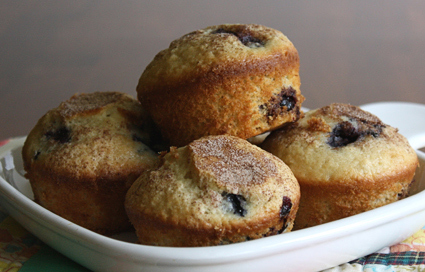 For a little extra pizzazz, top the muffins with cinnamon-sugar before baking. Make your own by combining 2 tablespoons of sugar with 2 teaspoons of cinnamon. Sprinkle three or four pinches of cinnamon-sugar on top of each muffin before baking. Bake regular size muffins for 25-30 minutes and bakery-style muffins for 29-34 minutes. Check muffins for doneness before time is up. Ovens temperatures can vary. Let muffins cool in the pan for 5 minutes before removing. Pig out! Update: Oops! Forgot to mention...for regular size muffins, fill muffin cups 2/3rds full. It's a little different from the usual scoop and level! These days most all-purpose flour comes already sifted for you. The word "pre-sifted" will be on the front of the bag. This is why we measure flour "lightly" into the measuring cup. Choose a regular kitchen spoon. The kind you eat cereal with will do fine. 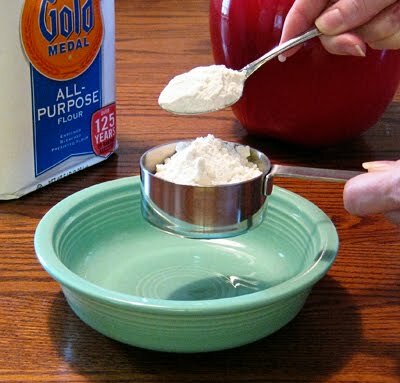 Take a spoonful of flour from the container. Hold the spoon an inch or so over the cup. Tip the spoon so the flour falls gently into the cup. Think "high and light". Level off the top with a straight-edge kitchen knife. Perfect! No-nos: You may be tempted to scoop or drag the cup through the flour. This will cause it to pack down in the cup and you'll end up with too much. I know from experience. One day, I did this while in a hurry and I made the driest biscuits you can imagine! Ha! Accurately measuring dry ingredients leads to success. Measuring cups are usually plastic or metal. Measuring cups come in a set in the following sizes: 1 cup, 1/2 cup, 1/3 cup and 1/4 cup. Measuring cups are used to measure dry ingredients such as sugar and flour. Dip the measuring cup into the sugar container. Hold the measuring cup over the sugar container to catch spills while you measure. Choose a kitchen knife with a straight edge. Level off the sugar with the straight edge of the knife by dragging the edge of the knife across the top of the cup. The excess sugar will fall back into the container. You've just measured a perfect cup of sugar! Now that we've covered measuring cups let's learn about measuring spoons!